COLUMBUS, Ohio —Declining farm income and farmland values likely will lead to an increase in the number of farmers who are delinquent on their loans and eventually a rise in farm bankruptcies, predicted a pair of Ohio State University agricultural economists. While the current farm bankruptcy rate is low, two per 10,000 farms nationally, that rate has gone up slightly in recent years and likely will continue to do so, said Ani Katchova and Robert Dinterman, both from the College of Food, Agricultural and Environmental Sciences. Bankruptcy rates seem to be a lagging indicator of financial stress after debt levels rise and delinquencies on agricultural loans increase, Katchova, Ohio State’s Farm Income Enhancement Chair, pointed out. One indicator of financial stress on farmers is the national increase in debt-to-asset ratio, which is projected to be 14 percent this year, a rate that has steadily risen since 2012. Also, net farm income is expected to decline this year by 8.7 percent to $62.3 billion, the fourth consecutive year of declines after reaching a record high in 2013, according to the U.S. Department of Agriculture’s Economic Research Service. Farmers financial wellbeing is also strongly tied to the value of agricultural land, Dinterman pointed out. For the past three decades, agricultural land values have been increasing, with the exception of 2009 and 2016, when there were declines, he said. “When land values rise and then suddenly fall, that seems to trigger bankruptcies across the U.S,’’ Dinterman said. Offsetting the current financial stress on farmers are low interest rates and farmers’ solid financial standing. “A lot of farmers are in strong equity positions right now. They have been in a position where they could ride it out a few years, but how many more years can they sustain with farm incomes that seem to be stabilizing into low levels?’’ Katchova asked. 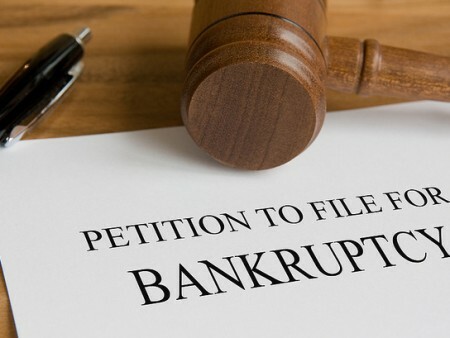 Farmers in financial trouble have a variety of options to pursue through bankruptcy chapters including Chapter 12, which was specifically designed for farmers and fishermen to reduce their financial burden while continuing operations. While there is a considerable variation across the U.S., farm bankruptcy rates remain low and stable for several Midwest states. Farm bankruptcy rates (Chapter 12 filings) have remained relatively low during the last decade, compared to the rates in the 1980s. The agricultural downturn during the last three years has resulted in a small uptick in farm bankruptcy rates, much of this driven by a slow-down in farmland values. Katchova presented the farm bankruptcies research at the Federal Reserve Bank of Chicago Ag Conference on Nov. 29, 2016, and at the USDA’s Agricultural Outlook Forum on Feb. 23, 2017. View Katchova and Dinterman’s USDA Ag Outlook Forum presentation and read their April 2017 Farm Bankruptcies Policy Brief. Learn more about research conducted by Ohio State’s Farm Income Enhancement Program by visiting go.osu.edu/farmincome.